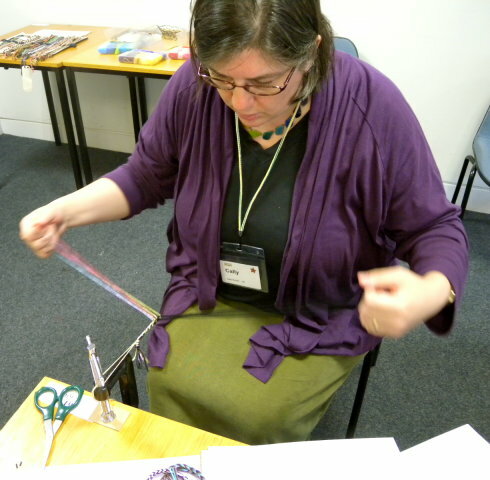 The class I taught at Braids 2012 was two days on how to make double braids as a solo fingerloop braider. First of all, a procedure for making 6 and 8-loop double braids (“double-square,” “double-flat”, and many other doubled braid shapes) as a solo braider. Secondly, but just as importantly, an understanding of the basic structure of these braids, so that all 12 or so of their shape variations would make sense—and therefore be easier to remember and to braid. 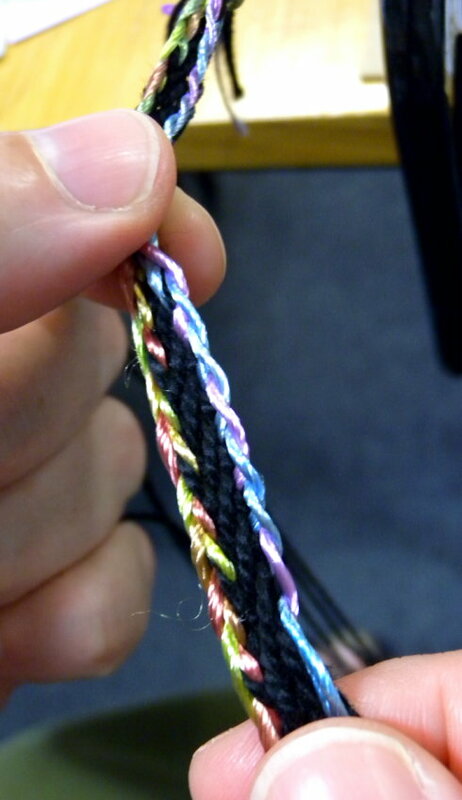 Sub-themes were ways to “tweak” the loop transfers or exchanges for interesting color pattern variations, a 10-loop version of the procedure, and a couple of neat ways to start a braid. Dominic’s red and blue-bordered flat 6-loop braid; a patriotic French braid—sorry the photo is so blurry! 10-loop samples of ‘half-hollow’ double braids. This shape variation can have oddly irregular-looking patterns–the lower one reminds me of cow-markings, or tiger/ leopardskin if made with tawnier colors. More 10-loop samples, these are the double-tube shape–an inner tubular braid surrounded by an outer tube of a different color or set of colors. The colors of the two layers can be made to switch places, or a hole can be left through which the inner layer can be seen… Also possible to make with only 8 loops. Close-up of two flat double braids–the upper one of 10 loops, the lower of 12 loops. 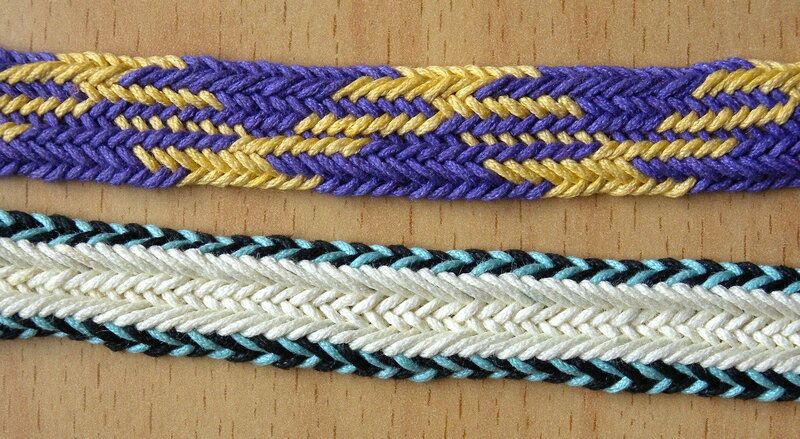 In the lower braid, loops are linked rather than exchanged across the two halves of the braid in order to create the contrasting border. I had been a little worried that it might get boring for the participants to focus on double braids for two whole days! Luckily that didn’t seem to be the case at all. These were some pretty committed braiders, many of them bringing a lot of experience and all bringing a lot of enthusiasm for loop braiding. 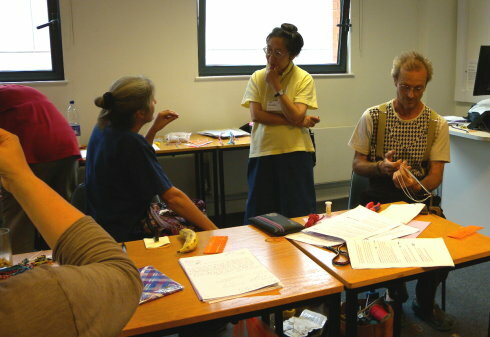 In the photo above, at the very back in a turquoise sweater is Asami Nakai, who came all the way from Japan to take both loop braiding classes. She is a scientist specializing in braids (either as an engineer or a physicist? )—so she is very familiar with braid theory and with braiding machines, but not with hand braiding. She had no trouble on the first day, and on the second day she started making an 8-loop double braid before I taught it!—just from reading the directions in my handout the night before! Ok, I have to sneak this photo in, even though it has no visible braids (unless those bows on Sandy’s shoes are braided?) We all got to pick out a FREE and gorgeous woven bag in several available colorways at the registration table on the first day of the conference. 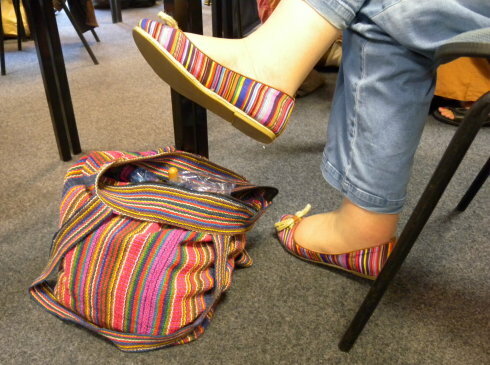 Check out the bag that Sandy scored, and the shoes that she just happened to have brought with her to the conference! 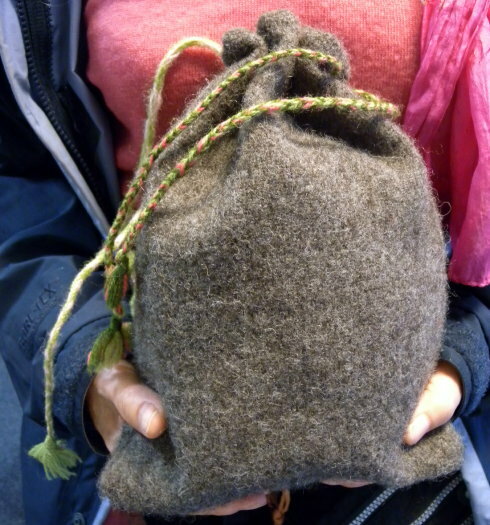 Above is Cally Booker, a weaver (her website is beautiful!) I wish I had taken a picture of the whole group at some point—unfortunately Tulvi Turo and Mari Voipio don’t show up in these random class shots I managed to catch. 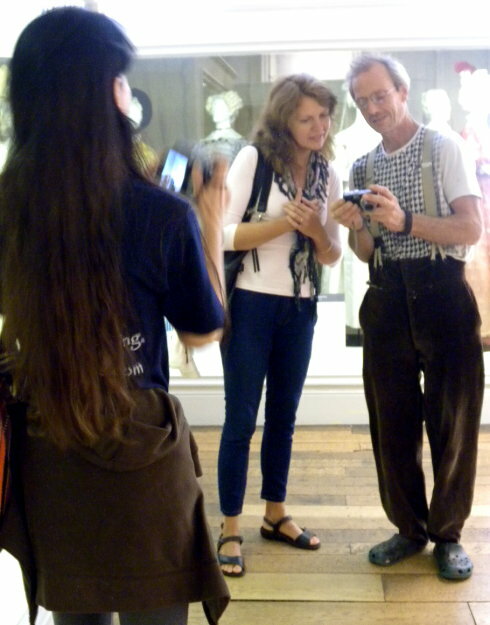 Here’s a later photo I took of Laverne taking a photo of Tulvi and Dom (at a beautiful little costume museum near the conference). Mari was only with this class for the first day, and she spent much of that day helping others in the class, which is a role she’s used to—she teaches loop braiding (along with lucet, sprang, tablet-weaving and probably more!) in Finland. Below is Jacqui Carey (braider, author, and researcher, plus teacher and keynote speaker at Braids 2012) talking to Europa Dawson, another Braid Society member I was very excited to meet. Europa had previously mentioned to me that she had learned loop braiding in China as a child. 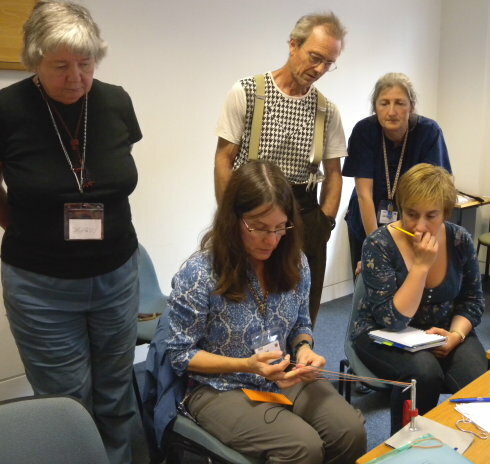 Then, in the second day of the workshop, when the topic arose of using thumbs to braid with, Europa casually mentioned that she had not only learned loop braiding in China in the 40’s, but had learned there how to make 9-loop braids using thumbs as well as fingers to braid with! And that many people knew how to do this—it was not considered anything special or unusual! 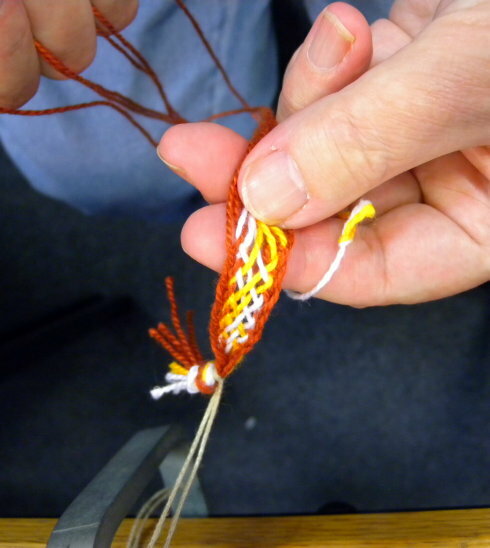 There was a little time at the end of the workshop to demo a couple of ways to start a braid with no loose ends. My favorite way is easy to do once you are used to it, yet very hard to describe—so far I have no good handout on it. I think most of them did end up taking something coherent away from the demo—Dominic was positively jubilant about being able to do this braid-start later!—What I don’t understand is how Jean managed to both photograph the demo and learn the technique! 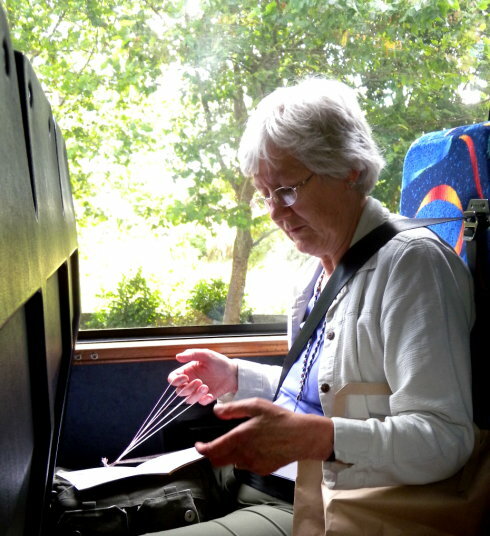 Here’s a photo I took the day before the start of my workshop, of Jean in the bus on the way back from our tour to the Macclesfield silk museum—she had hooked up a loop bundle to her bag and was braiding away! I do this as a passenger in car trips, but haven’t yet tried it on public transportation. Ok, I have to tell this story [I hope you don’t mind, Europa! ]: Europa mentioned in an email that recently she was braiding on a train, and accidentally hit the man next to her in the face! However he then told her that it was his own fault—he had been leaning over to see “what the dark threads were doing!” (Europa had been braiding the mysterious and amazing double tubular shape, where colors can remain hidden and then pop out whenever the braider chooses). So she may have injured someone, but she also got him interested in loop braiding! Her outfit had been a big hit with the Japanese participants—they took tons of pictures, and it occurred to me that it’s probably pretty rare for them to see traditional European costumes being worn, compared to how often traditional kimonos are worn in Japan. Meanwhile, even more braid-related events are crowding into my life… I just got back from a 5-day braiding retreat up the coast learning more about ancient Andean loop braids from Rodrick Owen, tomorrow I’ll be teaching braiding at a local ‘faire‘, then this coming weekend I’ll be meeting up again with Rodrick—as well as fellow Braids 2012-alumni Giovanna Imperia and John Whitley—at a second Rodrick Owen workshop down the coast. I think it’s been three years since Rodrick’s been out here to the west coast of the U.S. to teach, so I decided to treat myself to both of his workshops. He probably understands more about complex Andean braids than anyone on the planet—from examining these braids in minute detail (in museum collections) and then recreating them. He’s made many of them both with free-end braiding—sometimes called ‘finger-weaving’—and also using hand-held loops. Hand-held loop braiding was the technique that was most likely used to make the original braids—some made as far back as 3,000 years ago. Archeologists have excavated these pre-Incan braids in burials of important personages, who were swathed in yards and yards of rich textiles…the bodies and textiles almost miraculously mummified and preserved—apparently just from the extreme dryness and cold of the surrounding environment. *¹ I had already made teaching videos of 6 and 8 loop double braids for the workshop, and am about to make a 10- loop version, so if you were in the workshop (or in an earlier double-braid workshop) and want to access them, please contact me. *² Re: using thumbs as well as fingers to braid with 9 loops—To me this seems very natural and obvious when using the so-called “little-finger-operating” (“V-fell” or “Method 2“) style of fingerloop braiding. The woman who first taught me a 5-loop braid told me this was possible; and I subsequently had no problem doing it, based on what she told me which was simply to “add fingers to hold loops, up to a limit of 9 loops.” Yet no one else seemed ever to have heard of this—even Noémi Speiser and Masako Kinoshita—until 2007 when Masako found out that using thumbs in making 9-loop braids had been documented in a Finnish report in 1962. And now here is someone from China reporting that it was done commonly there in the 1940’s! I’m not even sure that loop braiding has been reported from China at all except in some of the more remote ethnic minority areas, so this may also be a significant report for that reason… There are ancient Chinese literary references to loop braiding, and a depiction of loop braiders in bronze sculpture that is thousands of years old, so there was definitely a history of loop braiding there in the past (cf Mari Omura, L-MBRIC). *³ In Jean’s drawings below, the double-length loop is bicolor, twisted one full twist, so the eventual upper shanks (red) of each of the two resulting loops are both on the same side , while the lower shanks (blue-green) of each loop are on the other side, the two sides LINKED together. The arrows serve to indicate the direction to pull the shanks a bit apart, so you can see each of them separately, and insert the bar or header-cord through the two loops (rather than between them). 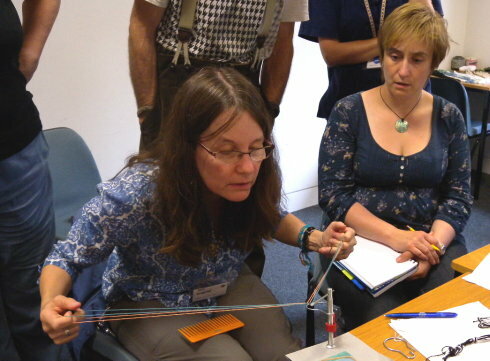 After twisting the loops as they lie flat on a table, she inserts the bar of a G-clamp (shown here as a black line) through each loop, under the central link, and places the two resulting loops onto her fingers, with red-shank-up and blue-shank-down on both fingers. The second drawing is a detailed view of just the center portion of the first drawing, with the support bar now inserted. 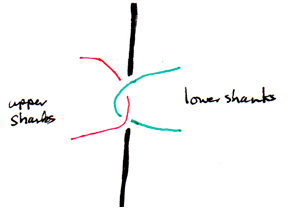 Bear in mind that, in the detail view, the two uppermost cut-off strands (one red and one blue-green) represent the two shanks of one loop, and the two lowest strands are the two shanks of another loop. The bar has been inserted through each loop, not between the loops. The upper (red) shank of each loop is linked around both lower (blue-green) shanks. You could substitute a header cord for that bar, or a nice firm shower-curtain ring is even easier, as long as you intend to start by braiding the ‘divided’ form of the braid, as for a loop or buttonhole at the top of the braid. When using bicolor loops, it’s only possible to have no ends at all at the the top of the braid if you are using an even number of bicolor loops. Otherwise, the one odd bicolor loop will leave two ends at the top of the braid. Unless you make that loop departed! Use a floss-type yarn for the braid – a yarn that can be split in half, and make only the single “odd” bicolor loop ‘departed’, from strands that are divided into half the thickness of the other strands in the braid. …See my bracelet-with-chevrons tutorial. In the last (?) video, I showed this method using doubled strands for all the loops except for the one ‘odd’ loop—another way to accomplish the same thing, if you want a thicker braid. However, an odd single-color loop can be linked around one of the double-length loops, leaving no ends at the top. 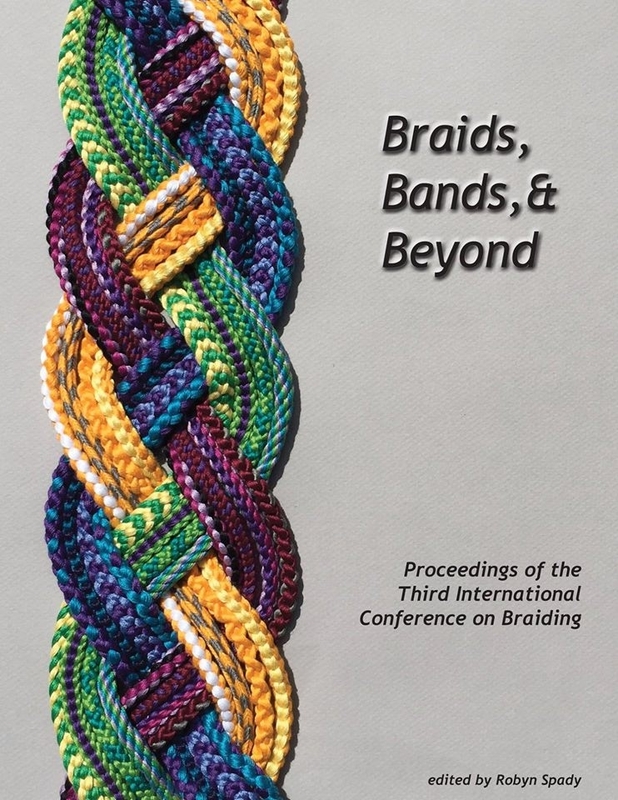 October 13, 2012 in Double braids, History, Knots, Starts & finishes, Loop Braiding, Readers' gallery. I would love to know how to do the braid that Sandy’s 6-loop double braid. Is there any instructions on the WEB? Hi Chuck, yes I now have a video teaching it. It’s for an 8-loop version of the braid, but to do it with 6 loops is very easy, you just omit the loops on the little fingers. Here’s the tutorial on 6-loop double braids. My next tutorial teaches how to make that braid come out flat. I teach it with 8 loops but if you’ve already learned the 6 loop braid, you’ll know what to do to make it with 6 loops. Sandy’s different-color border on her braid means an extra step in the braiding. I teach that extra step in the second video in my flat braid tutorial. Orange loops are on the left hand. Yellow/white loops are on the right hand. Start out with all the yellow/white loops in the same position (all yellow up or all white up). Follow the second video in my Flat double braid tutorial, but only use 6 loops. Hi Colleen thanks for visiting and for being interested in loop braiding–it’s a very fun technique, esp for a textile nerd (speaking as one myself!). Thanks for the link!